*The Following Massachusetts and Middlesex County supplemental forms are included as a courtesy with your order. Use only for recording in Middlesex South and if document itself does not meet formatting standards. This document lists transfer tax rates by consideration amount. This informational document explains the recording requirements in Massachusetts. The Residential Exemption is a dollar amount of value that is exempt from taxation. For example, in FY 2017, a City of Sommerville home valued at $500,000 and eligible for a residential exemption would have had $235,399 deducted from the property's assessed value. This saved qualified homeowners $2,747.11. Are these forms guaranteed to be recordable in Middlesex County	? Yes. Our form blanks are guaranteed to meet or exceed all formatting requirements set forth by Middlesex County including margin requirements, content requirements, font and font size requirements. What is the Massachusetts Notice of Identification? Subcontractors, vendors, and design professionals involved in a work of improvement must send a special type of notice when they have not contracted directly with the original contractor or property owner and are working under another party. This preserves these individual's rights to a mechanic's lien while letting the owner know who is involved in the job and may have a later claim if unpaid. In Massachusetts, a lien claimant without a direct contractual relationship with the original contractor, except for liens for labor, can only claim an amount of lien less than or equal to the amount due or to become due under the subcontract between the original contractor and the subcontractor whose work includes the work of the person claiming the lien. M.G.L. Ch. 254, 4. However, if the claimant files a Notice of Identification within thirty (30) days of commencement of his performance, lien rights are preserved for the full amount of services or materials expended. Id. The Notice of Identification contains the following information: 1) contractor's name; 2) name of the party sending the notice; 3) whether the claimant is a subcontractor, vendor, or design professional; 4) name of the person contracted with; 5) name of the person or party furnished; 6) the property address where work is performed; and 7) the amount of the contract. Id. The Notice must be sent via certified mail, return receipt requested, to the original contractor within thirty (30) days of starting performance. The amount stated in any such notice of identification shall not limit the amount of the lien. Id. Any inaccuracy in the naming of the contractor or other information in such notice shall not affect its validity provided there is actual notice. Id. This article is provided for informational purposes only and should not be relied upon as a substitute for professional legal advice. If you have questions about the Notice of Identification, or any other issues related to lien laws in Massachusetts, please consult with an attorney. 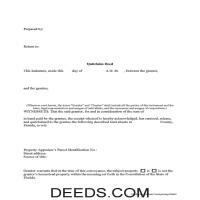 Get your Middlesex County Notice of Identification form done right the first time with Deeds.com Uniform Conveyancing Blanks. At Deeds.com, we understand that your time and money are valuable resources, and we don't want you to face a penalty fee or rejection imposed by a county recorder for submitting nonstandard documents. We constantly review and update our forms to meet rapidly changing state and county recording requirements for roughly 3,500 counties.